Some days I feel like having a meat-free meal, which can be a challenge due to my legume, soy, and nut allergy. Tofu, beans and lentils, and nut butters and cheeses are all popular vegan protein sources. But what about black Japonica rice?! It contains 4 grams of protein, plus 12% of daily fiber, and 6% of daily iron per 1/4 cup serving (stats taken from Lundberg Black Japonica Rice package). Not only does it contain valuable nutrients, but it has an earthy taste and meaty texture that are very satisfying, and it’s quite filling. This recipe keeps well in the fridge and packs well for lunch. Wrap the rice salad up in a lettuce wrap, or serve as a side dish with lunch or dinner. Add all dressing ingredients to a small bowl and mix well. Set aside. Heat the oil in a non-stick pan and add all the chopped veggies and basil. Quick fry on medium-high heat for about 5 minutes, stirring often, until slightly softened. Mix the veggies with the cooked rice. Pour the dressing in and mix well. 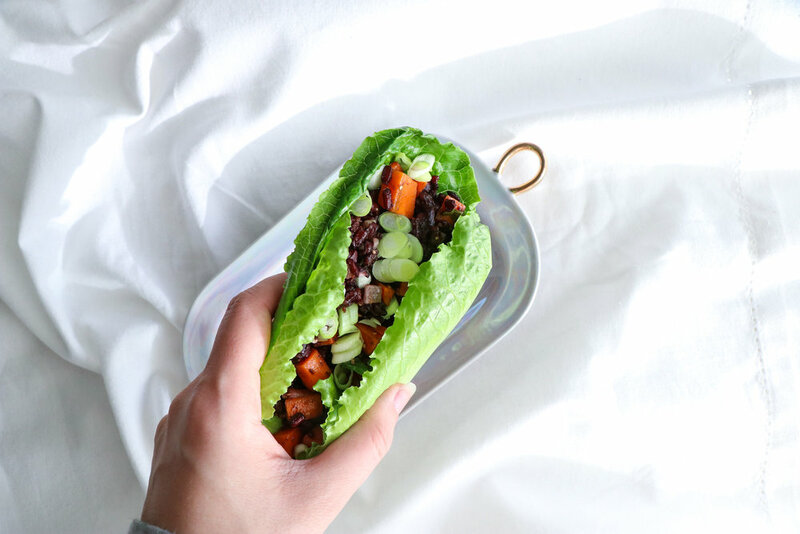 Serve in a romaine lettuce leaf like a taco, and garnish with fresh basil and green onion.